If religion, she also liked to say, is the opiate of the masses, fundamentalism is the amphetamine. I believe the word used wrongly distorts the world. resolution of doubts but in their proliferation. Poetry is the language of intensity. Because we are going to die, an expression of intensity is justified. 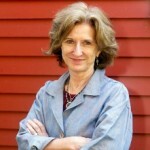 C. D. Wright was born in Mountain Home, Arkansas to a chancery judge and a court reporter. She earned a BA in French from Memphis State College in 1971 and briefly attended law school before leaving to pursue an MFA from the University of Arkansas, which she received in 1976.